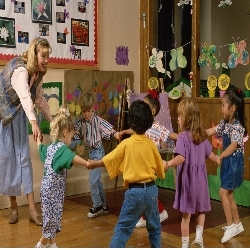 When preschoolers gather to play, they are small bundles of energy. Best to have a play theme to corral all that creativity and you’ll kill two birds with one stone: you’ll maintain your sanity and the kids will have a terrific time. Preschool children are full of imagination. Most of them spend far too much time in front of televisions or playing video games, so when you have the chance to encourage creative play, go for it. Think of a simple theme such as farm, jungle, pilot or astronaut, or even pirates and then plan some creative activities around that theme. For instance if you choose to “play pirates” you might gather some cardboard boxes to become a ship, provide eye patches and materials to make cardboard swords or spyglasses. Make a snack that mirrors the theme, such as gold circles of cheese and round crackers as “treasure” or purchase plastic swords to place on top of cupcakes. A jungle theme might include stuffed animals and a safari through the back forty. The farm might include planting some seeds in cups or creating a salad from fresh veggies. Remember preschoolers will play and create with just a few suggestions and the smallest hint of ways to begin. Often all you need to do is ask a question such as “Who wants to decorate this pirate ship?” Or provide a prop such as a helmet to encourage play as a pilot or astronaut. What play themes have worked for you? Do your preschoolers love to make up their own play storylines? Do you have any stories of playdate hits or misses to share? Here is a site to help you get started with fun jungle play ideas.